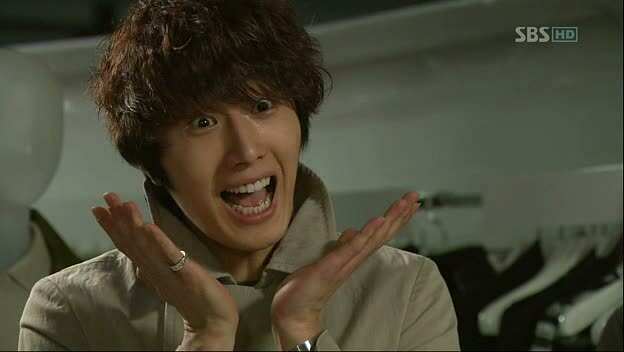 I can’t believe how unexpectedly good dramas have been this year thus far. I had no intention of liking 49 Days because I wasn’t the least bit interested in 98% of the cast (Lee Yo-won, Jo Hyun-jae, Nam Gyu-ri, Bae Soo-bin, Seo Hye-jin), but yet here I am. C’est la (k-drama obsessed) vie. I do have to preface with the disclaimer that even though I feel very positively about the drama so far, only eight episodes have been broadcast. At the moment, I’m tentatively erring on the side of caution, because it’s still relatively early in the game. There is the dangerous possibility of a Cinderella’s Sister redux: smooth sailing for the first half, and then mind-blowing confusion in the second. What I really enjoy so far are the conflicts that arise out of Song Yi-kyung and Shin Ji-hyun’s body switch. The writers have been very careful with rules and boundaries, to the point where even I’m caught off guard by the realism. For example, I haven’t considered the fact that yes, there are going to be people who will run across Yi-kyung when she’s just Yi-kyung, not when she’s Ji-hyun-in-Yi-kyung. They touched on that briefly during episode seven when Han Kang saw Yi-kyung in her natural state, without Ji-hyun inhabiting her, which I’m sure will eventually get to the point where Han Kang will confront Yi-kyung AS Yi-kyung and she will not recognize him at all. It’s easy to write a fantasy story and then just do whatever the hell you want because you’re uninhibited by the forces of reality, but it’s a good mark of smart writing when you account for every possible outcome. Another thing I really enjoy is the level of mind-fuckery that’s been introduced into all the characters’ relationships, so that the story becomes one huge guessing game. When In-jung runs into Yi-kyung at Min-ho’s house, she has no reason to be angry at Yi-kyung’s presence because nobody’s supposed to know of her relationship with Min-ho, so she can’t exhibit in an accusatory attitude in any way. There’s a certain level of meta in all of this, because technically In-jung has every and any right to be at Min-ho’s house to Yi-kyung — Yi-kyung is not supposed to know that she’s not supposed to be there. We as viewers know all of this because we have the power of viewing this story through an omnipotent narrator who can traverse through different dimensions of space, and the writing has been so good so far that you may even forget that Yi-kyung is allowed to manipulatively voice her accusations without anyone being aware of her true identity. Then on top of that is the introduction of Min-ho’s feelings towards Ji-hyun-as-Yi-kyung because now he has to backpedal on his relationship with In-jung. While he’s not exactly redeeming himself by putting a halt to his scheming, his backpedaling on In-jung inherently weakens his journey towards his ultimate goal. I hate it when bad guys go from zero to hero because of love, so it makes a lot more sense that Min-ho inadvertently creates his own downfall. I enjoy that his side of the story isn’t as straightforward as just Ji-hyun securing evidence of his scheming; I love that it grew out of a tangent. What this Min-ho/Yi-kyung arc introduces, however, is a girl/girl rivalry that I’m not so fond of, because in rooting for Ji-hyun, In-jung becomes the evil caricature. And even though Min-ho was cheating on his fiance with In-jung, he is now cheating on his cheating, yet we’re not allowed to root for In-jung because Yi-kyung is the protagonist. This is simultaneously fucked up and amazing. Female villains always end up being the truly conniving and manipulative ones, and very rarely do they get the chance to redeem themselves. While In-jung may have been the textbook villainness at first, she was softened a lot as we learned of her hesitations, and now she’s thrown firmly back into “evil villain” camp. Sad. The last and final point of interest — but also most compelling methinks — is the Scheduler’s identity. The show’s been dropping hints left and right that he’s related to Yi-kyung, but episode eight throws us a little off-track once again. A sibling relationship seems like the the instinctive answer, but the moment he shared with Yi-kyung at the door of the coffee shop was WAY. NOT. sibling-like. 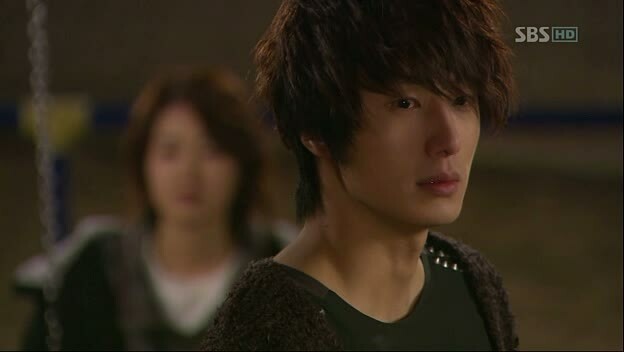 ** The moment was intense, filled with longing on Mr. Scheduler’s part and totally electrifying. I…don’t do that with my brother (gross), so I’m only guessing that a blood relationship is the obvious-but-wrong-answer to this mystery. Aside from the story, I just wanted to comment briefly on the cast and say that I like almost everyone immensely. I like Nam Gyu-ri a lot more than I thought I would, mainly because her style of acting, amazingly, works for her character. She’s dumb and happy and her character doesn’t require any intensity, so Nam can just groove along with being cute. As for Lee Yo-won, I have watched one too many dramas starring her (Bad Love and Fashion 70s) and I’ve allllllways found her to be a drag. Fortunately, she is not a drag at all in this story and she totally wins me over as both the deadened Yi-kyung and bubbly Ji-hyun. **Also, I read spoilers and now I want to spork myself in the eye for being a slave to forums and link-throughs and bolded “SPOILER!” hyperlinks. Damn me. 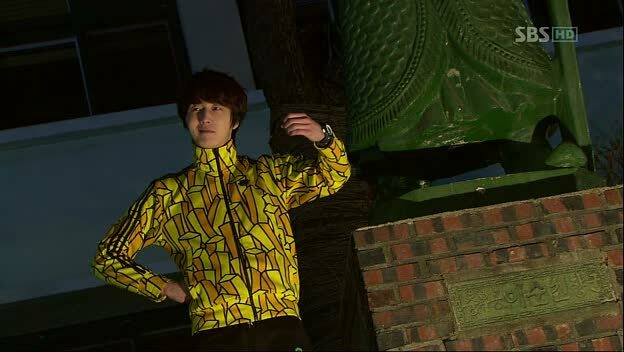 So good dramas have bad tracksuits? OK, fair rule of thumb. Or, the best tracksuits us plebians have ever laid eyes on, if you look at it from the other side of the coin. i would lurve me some fries tracksuit. i mean c’mon! how awesome would it be to work out in that? bahahaha. i’m liking the drama so far, but it’s not at the cracktastic level for me yet, and i’m def. still wary since we’re only halfway thru. jung is so much finer with his soft, perfect, straight hair, but he just had to throw a bowl of noodles on his head to get a perm. sigh.